Besides, is lying really always wrong? What if it serves noble ends? Isn’t deception just a social lubricant, allowing us to get along? Shouldn’t we lie to prevent harm to another? If lying is always wrong, then are studies in human behavior ethically indefensible? What about undercover police work? Or the bluffing, puffery, and lowballing that can characterize negotiations? (And let’s not even get started on deception in mediation.) Despite what we tell our children about lies, deception may be indispensable. But a movement known as Radical Honesty proposes instead that the truth will set us free: it calls for no-holds-barred, “direct, open and honest conversation” as the best way to build meaningful relationships. Journalist A.J. Jacobs recently took up the challenge. In “I Think You’re Fat“, an article from the July issue of Esquire, he describes his experiment in Radical Honesty and its impact on his work and personal life. Jacobs discovers one upside: “One of the best parts of Radical Honesty is that I’m saving a whole lot of time. It’s a cut-to-the-chase way to live.” The downside? Radical Honesty can be downright cruel. An acquaintance recovering from a recent tragic loss seeks Jacobs’ professional advice on poetry he’s written. Jacobs cannot bring himself to tell the truth: the poetry stinks. When faced with a choice between honesty or compassion, Jacobs opts for compassion. Read Jacobs’ essay and ask yourself what choices you might make yourself. It’ll leave you thinking–and that’s no lie. A similar aspiration can be found in the bible at Ephesians 4 (I think). 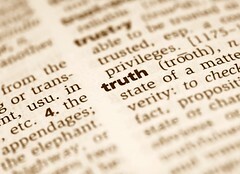 Something about the need to “Speak the truth in love”.I touch upon this issue (honesty, not biblical teaching!) in my article “Things I still love you too much to say” back at Embracing Conflict.As a divorce lawyer, the lack of honesty within communication is often clear to see, and the fallout from this particular conflict aversion is a real tragedy.I’ll have a look at Radical Honesty. Thanks for the article!